5793 labyrinths found. Showing 5701-5720. Sorted by country, state, city, then zip/postal code. All are welcome from spring thaw to first snow fall. Labyrinth is located on the lower level next to The Nativity Collection, and is fully handicapped accessible. Labyrinth is always available when the church is open. 5 miles south of Pittsville, 20 west of Wisconsin Rapids, 2 hours north of Madison. From Portage North on Cty CX to Grotzke Rd, turn left onto Grotzke Rd., travel 1.1 miles turn right onto Kuhn Dr. Labyrinth is on left, first drive way on left, you will see a sign at end of driveway. This is a handicap accessible labyrinth. My wife and I hauled 4,000 pounds of rock by backpack from all across the Tristate area. Many are from sacred land throughout the driftless area. 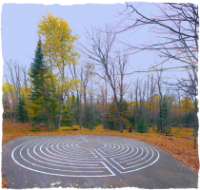 The labyrinth is constructed alongside the great Native American Highway that ran from the Gulf of Mexico to Canada. Open from spring thru fall, daylight hours. From the east side of Rhinelander, Wisconsin, travel east on County Highway C to Limberlost Rd. Turn right (south) on Limberlost Rd. Note: Limberlost Rd. winds around for less than two miles. At approximately 1.5 miles, do NOT follow the private spur of Limberlost straight ahead, but instead turn RIGHT and continue one-fifth of a mile to end of road. Labyrinth will be on asphalt cul de sac at road's end. Please respect all private property along Limberlost Rd., and be mindful of the wildlife that may be in area, including Black Bear. Pathway laid out in the Chartres configuration. 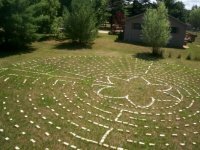 This labyrinth is located at Pilgrim Center on Green Lake, a camp and year round retreat center related to the United Church of Christ. Guests are welcome. Please call in advance. The labyrinth in located in an old field that is growing shrubs and trees through natural succession. The path is a little uneven, like life, so wear sturdy shoes. 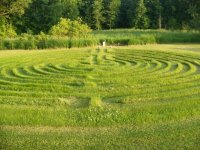 The labyrinth is on our property and is open to the public. 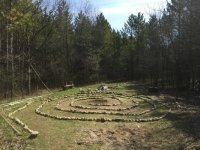 Stone labyrinth consisting of two classical spirals that circle in and circle out around a central fire, surrounded by a forest of pines. Riveredge Nature Center is open from dusk till dawn. There are special evening labyrinth programs. All visitors must pay nature center trail fees. Two labyrinths - a canvas labyrinth for indoor use and an outdoor labyrinth to walk.